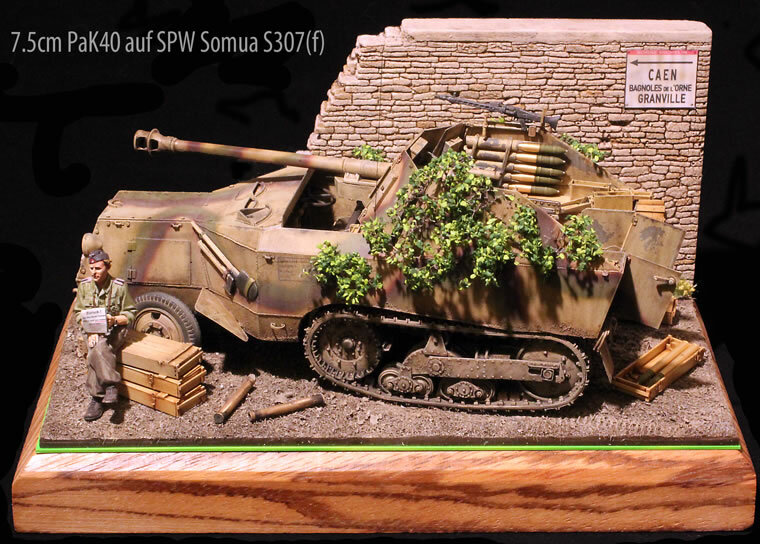 For Normandy buffs, the Somua MCG 7.5cm Pak40 is a cult subject. 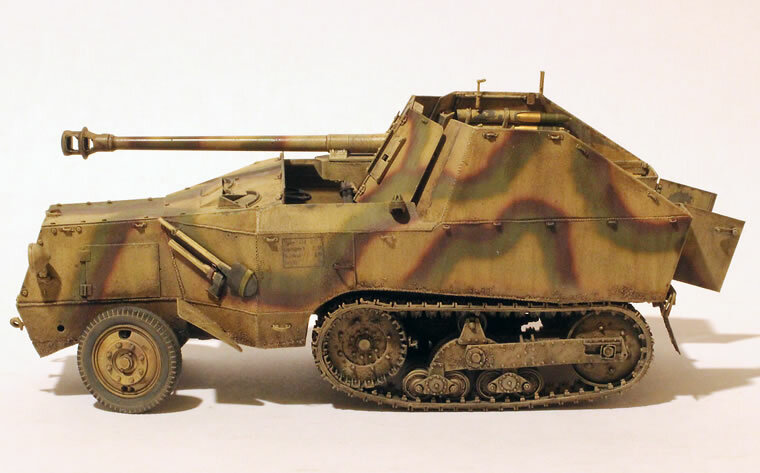 A small number of these odd vehicles from the Becker menagerie were used by the Panzerjager companies of the Panzergrenadier regiments of 21.Panzer Division in the fighting around Caen during Operation Goodwood. 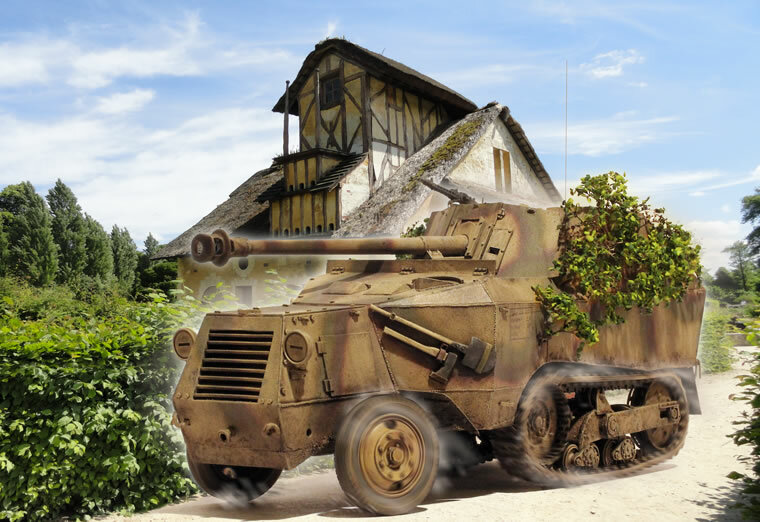 References on this rare type are quite scarce though one of the related mortar vehicles has survived in France. I was quite pleased to find this new Italian resin kit this past summer while on a business trip to France. The Brach kit is extremely good. The main body of the vehicle comes molded in a single large casting, which makes assembly very straight forward. The overall casting quality is very good, except that some of the flat surfaces on the main casting seem to suffer from a slight “orange peel” texture. The method of attaching the cast parts to the sprue is excellent, and removal of the parts from the sprue was very easy compared to many resin kits I have assembled. I found overall fit of the parts to be very good as well. The kit comes with a very nice turned aluminum barrel. Detail is quite good throughout, and the little tie-downs for the camouflage are truly remarkable. This is certainly one of the best resin kits I have built in many years so far as casting quality and assembly is concerned. A significant issue when dealing with open-topped vehicles molded in resin is the scale thickness of the armor plate. The Brach model is admirably thin for a resin model, but still a bit thick for my taste. I dealt with this issue by thinning the most obvious panels to a knife edge using sanding sticks and files, and I replaced some panels such as the front armor shield and rear walls using sheet plastic. The interior was a bit sparse, but there are no adequate photos of this to show how they actually appeared. I assume that there was considerably more ammunition stowage than provided in the kit, so I raided a Tamiya Marder III for the side stowage racks. I repositioned the kit radio, and added the gun travel lack, also from the Tamiya kit. 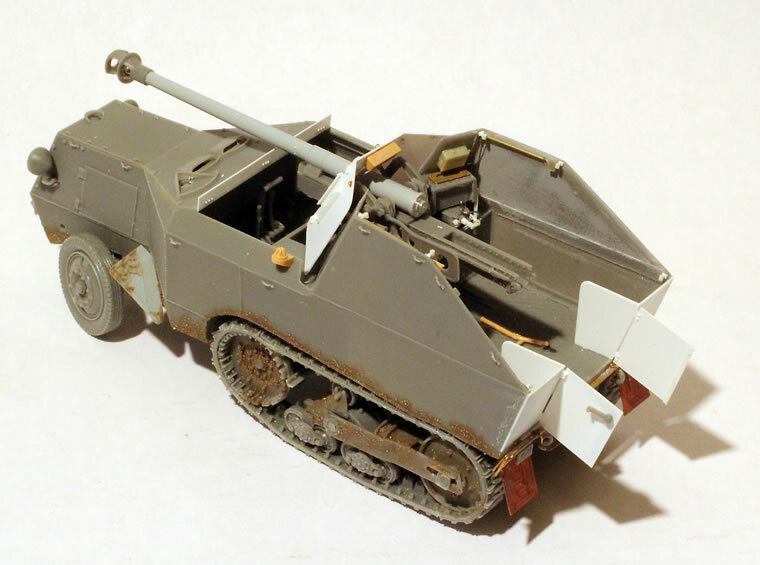 The ammunition stowage comes mainly from the AFV Club ammunition set, though the wooden ammo boxes took considerable work so far as detail was concerned. The brass ammunition is from Tamiya. I added a lot of small detail inside the fighting compartment, such as intercom wiring, etc. Much of this is conjecture due to the lack of adequate references. I painted the model in Tamiya acrylics, using a heavily lightened Tamiya dark yellow as the base. The pattern is based on various historical photos. Normandy was notoriously dusty in the summer of 1944, so I toned down the contrast of the 3-color camouflage using a glaze of Tamiya clear with a bit of a light sand color. 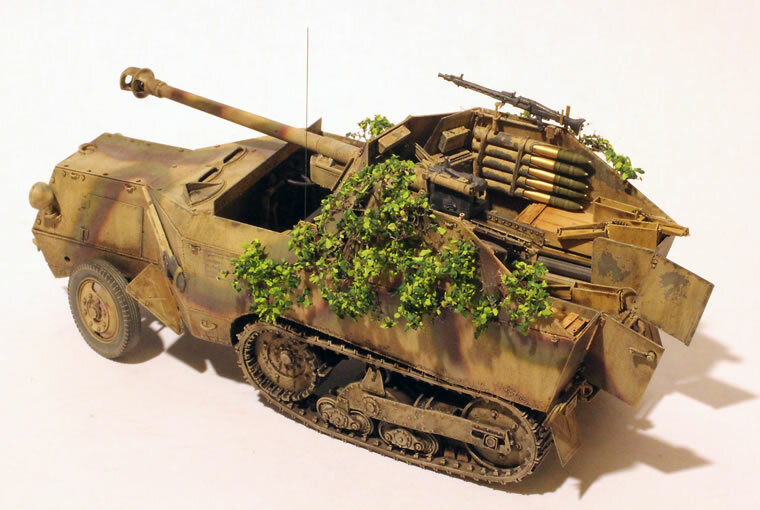 The foliage camouflage is the usual seafoam with Noch leaves attached using 3M spray adhesive and coated with hairspray for better durability. I followed the usual Wehrmacht practice of attaching the branches by first creating a net of wires connected to the various tie-downs on the hull side, then gluing the branches in place using carpenter’s glue. The thin wires were replicated with fine nylon thread as used by fly-fisherman for tying fly lures. The base is my usual construction of a plexiglass sheet with Aves Apoxie Sculpt for the terrain, with a chunk of MK35 plaster wall and a sign from one of the Hudson & Allen sheets. The figure is from the ever-dependable Alpine line.